Peter Paul Rubens, Flemish (active Italy, Antwerp, and England), 1577 - 1640, and Frans Snyders, Flemish (active Antwerp), 1579 - 1657. In Greek mythology the Titan Prometheus stole fire from the gods on Mount Olympus to give to humanity. Furious, Zeus, king of the Olympians, ordered Prometheus forever chained to a rock, where each day an eagle would devour the Titan’s perpetually regenerating liver. This painting, which Rubens considered one of his most important works, represents the virtuoso artist at his absolute height. Working in collaboration, a common practice for master artists in Antwerp in the first two decades of the seventeenth century, Rubens and the famed animal and still-life painter Frans Snyders, who contributed the eagle, rendered the brutal tale of Prometheus with corresponding violence. The enormous bird’s beak rips open the Titan’s torso, exposing blood-soaked entrails. To gain purchase on the captive’s flesh, one of the eagle’s talons gouges Prometheus’s right eye. His left eye is locked on the predator, signaling he is fully aware of his torture, while his writhing legs, clenched fist, and tousled hair convey the Titan’s abject agony. Rubens, who intensively had studied the art he saw on his travels to Italy, Spain, and England, derived the hulking figure of Prometheus, with its broad frame and dense musculature, from prototypes by Michelangelo. The picture’s asymmetrical composition, in which Prometheus tumbles downward with his left arm almost reaching beyond the canvas, was inspired by a painting by Titian of the giant Tityus (1548–49; Museo del Prado, Madrid). Here Rubens masterfully synthesized and melded these sources with his own Baroque sensibilities. Christopher Atkins, from Philadelphia Museum of Art: Handbook. Philadelphia: Philadelphia Museum of Art, 2014, pp. 126–127. Peter Paul Rubens kept this enormous painting of Prometheus Bound in his personal collection for several years and in a letter of 1618 described it as one of his most important creations. Known to have collaborated with other artists, Rubens noted in the same letter that Frans Snyders, who was distinguished for his depictions of flowers and animals, had painted the eagle. This enormous bird, whose wings span the width of the canvas, tears the hero's powerfully muscled body with its sharp talons, rips open his side, and devours his liver. Part of Prometheus's punishment for having dared to steal fire from the gods was that his liver regenerated daily, only to be eaten again by the eagle. 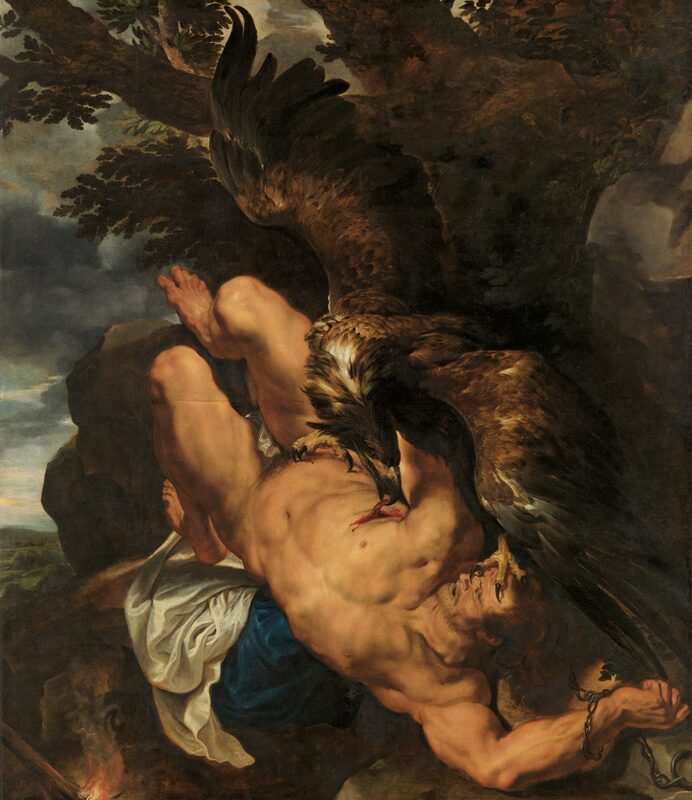 Interpretations of this Greek myth of an epic struggle between the eagle and Prometheus had acquired many allegorical resonances by the early seventeenth century, which Rubens, one of the most cultivated and literate figures of his time, would have surely known. This complex painting could be regarded as the artist's commentary on either the struggles of creativity or the ideal of heroic spiritual suffering. Katherine Crawford Luber, from Philadelphia Museum of Art: Handbook of the Collections (1995), p. 174.